Twenty-two students, from grades 9-12, participated in Session I of the School of Engineering Summer Camp. High school students stayed in Bluff Hall as part of the residential camping experience. Newly added this year is the partnership with Phillips 66 Wood River Refinery, according to Gordon. Phillips 66 sponsored scholarships, equipment, camp activities, and provided some professional opportunities for camp attendees. 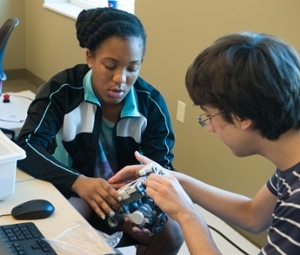 Those wanting to participate in the School of Engineering Summer Camp are required to fill out an application, which includes an essay and a recommendation from a teacher or a counselor. The summer camps have also translated into more students for SIUE. 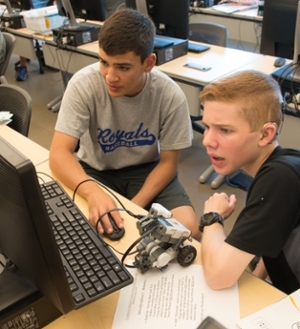 Shown in a robotics class are (from left to right) Kevin Roberts of Elgin and Jake Noll of Columbia, Ill. Working on setting up the robot are (from left to right) Alexis Cushshon of St. Louis and Max Smidowicz of Edwardsville.